The term telangiectasia originated from three Latin words: tel, angio, ectasia which denote tip, vessel, enlargement respectively. Telangiectasias can be classified into three large groups: "spider" or "star", linear and arborizing telangiectasias. A"spider" telangiectasia develops in children and teenagers. It rear occurs in adults. A "spider" telangiectasia is looked as a large main vessel with smaller "legs" around it. On the photos you can see the linear and the arborizing telangiectasia, which looked as a tree. This forms consist of the vessels of similarly diameters. Leaner and arborizing telangiectasia usually develops in adults. Telangiectasias localize as a rule on face and legs. Diameters of the ectatic vessels are from 0.1 to 1 mm on the face and from 0.1 to 3 mm on the legs. The most patients, who come to clinics of dermatology and aesthetic surgery, are patients with telangiectasias. Telangiectasia is term for ectatic vessels of skin, which are located on face and neck or on legs, in about of 60% and 20% of cases respectively. About 30 % of fare skin population suffer from the telangiectasias.The most common factor in occurrence of facial telangiectasia is weakness of the vessel walls due to chronic sun exposure. Genetic predisposition, liver disease, surgical trauma, radiation therapy, chronic steroid use, deep chemical peeling of the face may also play a role. Methods of removing telangiectasias may be selective and non selective. Some years ago a common method was electrocautery. Electrode may equally destroy ectatic vessel and adjacent normal tissue. Thus scars, hipo- and hiper- pigmentation may occur after electrocautery.Most physicians consider that non-selective methods are not suitable for the vascular and pigmented skin lesions removing in case of facial location. Selective laser coagulation is based on the concepts of selective photothermolysis. Abnormal vessels selectively absorb laser light and warmed. The vessel temperature increases to 60 - 70 Grad C causing the abnormal vessels destruction. Adjacent tissue far less absorbs light of "vascular" laser and don't injuring. Thus light of "vascular" laser may selectively destroy of abnormal tissue. The treatment is accurate as in microsurgery. Radiance of "vascular" laser must have the characteristics to provide the selective destruction of telangiectasias. Fluence F = P*T/S . One of the best "vascular" laser is a copper vapor laser which can provide the optimal combination of treatment parameters. For the copper vapor laser "Yahroma-Med" (manufactured by P.N. Lebedev Physics Institute, Moscow, Russia) great investigation work have been fulfilled to determine the parameters, mode and schemes of the treatment of vascular lesions and telangiectasias in particular. Articles and The Methodology (Edited by Russian State Medical University) became the results of this work. some untreated area around every treatment point. Adult patients tolerate the treatment of telangiectasias with the copper vapor laser "Yahroma-Med" without anesthesia. Local anesthesia can be required for the most sensible patient. The treatment with other "vascular" laser available on the market is more painful. The patients suffer no pain after the procedure. Middle erythema can occur during two hours after the treatment. After the copper vapor laser treatment scabs can be noted along treatment vessels can be noted. They spontaneously resolve during 3 to 7 days. However many physicians using Yahroma-Med choose such laser parameter that scabs can't be noted at all. 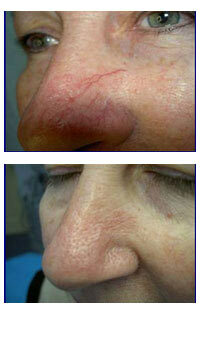 On photos 1 and 2 you can see the patients before and a day after one treatment session with Yahroma-Med. Complete or almost complete clearance achieved in 90% of patients. Telangiectasias on cheeks are usually easy to treat. Telangiectasias of nasal alae are more complicated for treatment and required particular caution. Some patients with telangiectasias of nasal alae may be resistant to the treatment (about 4%). Abnormal vessels disappear during the treatment. Most abnormal vessels disappeared after one treatment but not all vessels. Appearance of the patients notably improved (photo 1 and 2). Many patients satisfied by the results of one treatment. However two or tree treatments may be require for removing all ectatic vessels. New ectatic vessels can began to appear in some years if the patient predisposed to telangiectasia. In the beginning they may be easy removed by laser. If the patient avoid the factor, which play a role in occurrence of telangiectasias, ectatic vessels may not appear at all.